Here is a good example of SO being unnecessarily run above a drop ceiling. I believe it was done for reasons of neatness. The cord fron the server(?) 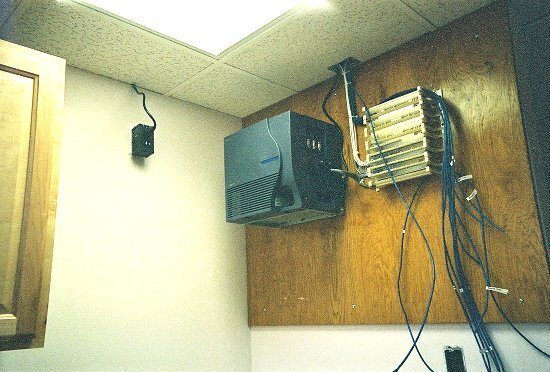 goes into the ceiling, over the server, and out to the "wall wart" in the receptacle next to the server. Sure am glad the phone/data guys have to follow the NEC, as we do- or so they keep saying! Though photos can sometimes be hard judge things from, that cord looks to me to be a lot less robust than SO. The power cable with most heavy duty equipment (and that looks like Cisco brand) is usually SJT. Cheaper PCs come with PVC RWW. The "wall wart" looks to be a Tripplite heavy duty surge protector. Those things are heavy enough that they'll pull out from the outlet if you don't use the mounting bracket (like this one didn't). The bracket uses the faceplate's screw, which is covered up in the picture.